The discussion tool comes with integrated private messaging functionality. It is located under “Discussion and Private Messages” (top menu bar). Course site members have the ability to send and reply to private messages (PM) to any active site participant and instructors. The Private Messages area comes with an Inbox, a Send Box, a Drafts folder, and the ability for users to create custom folders. The Inbox includes all the messages that were sent to you from other users of the site. The Sent box saves copies of the Private Messages that you sent to others. Users will get a copy of the Private Message via email if they have enabled notification in their Preferences, or if the PM was sent with high-priority notification.They will get an email notification at the email address associated with their Etudes account. The email message includes the text of the PM, as well as the name of the sender. Copies of Private Messages are not sent out via email if the site is unpublished, regardless of their priority setting. To reply to the copy of the Private Message that was received via email, users must log into their Etudes site. Upon entering the discussion tool, users can see immediately if they have any new messages. The number of unread, new messages is shown in parenthesis at the top menu bar. See image for an example. You can see which messages have been read, what’s unread, and what you have replied to. Post a reply to a private message. click on Quote once you open the message. Select messages and mark them as read. This is useful if you’ve read the messages in your email and there is no need to reply in Etudes. Flag a message for follow-up, and remove the flag later. Note: Private Messages will be not be emailed out to students if the site is Unpublished, regardless of its priority setting. Scroll down and find the user that you want to send a private message to. Click on the PM icon next to the user’s name. Type a subject and message and post. Click on New Private Message. Select the user, type a subject, the message, and post. 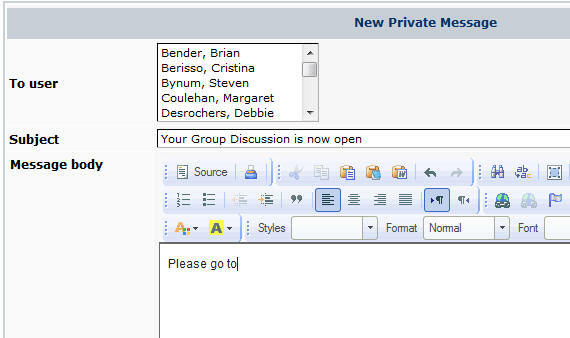 3) Clicking on the PM button in a user’s discussion post will also open the new private message window. Before clicking on Post, see if you need to make any additional selections. For example, you have to option to check a box and send a PM with high-priority email notification. With this option, the user will receive an email with the private message, regardless of their email notification setting in their preferences. Checking the high-priority box will override their preferences setting and they will receive the PM in their in-box. Private Messages that you sent with ‘high-priority’ email notification will be flagged in your Sent folder and in the recipient’s Inbox with a high-priority red icon so that it stands out as “important”. Please do not overuse this feature, or your students will begin filtering your PM’s. 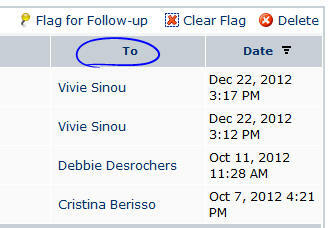 Check this box only when sending out critical or urgent Private Messages to specific students that you need to reach. Note: Instructor roles can send a PM to as many site members as needed, or the entire class. Students can PM only one person at a time. 3) While you’re reading a discussion message from someone, you can click the PM button under their post. Type a subject and a message and click on post. That will set it up to send them a private message.. When replying to Private Messages, click on Reply or the Quote button. They serve the same function. The original message is included in your reply so that there is a record of the original communication. You can delete the quoted text, if you want, but it is beneficial to leave it at the bottom for reference to your sender. When you reply to a private message, you have the ability to blind copy (bcc) others, as well. To bcc others, click on “Add bcc user. A field will appear, allowing you to select others to bcc in your message. To select more than one user, hold the Control (PC) or Command (Mac) key and click a user to select him or her. Click again to unselect it. Instructors can bcc as many users as they wish. Students can only bcc one person. Users may sort Private Messages (in their In-box & Sent box) by name to group them together. This allows instructors and students to review all the private messages that they received by a specific user or all the messages that they sent to a user. 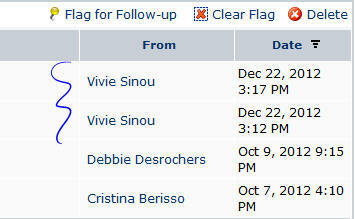 To view all the messages that you received by a student, click on the “From” header in your “In-box”. Click on “From” again to switch between ascending and descending order (A-Z or Z-A). To return to chronological order, click on the “Date” header. If you’d like to review the communication that you sent to a student, click on the “Sent Box” link, and then on the “To” header. Students and instructors can compose a private message and save it as a draft. Drafts are stored in a separate folder. Users can see clearly how many private messages they’ve saved as drafts from their in-box. Once posted, the drafts get moved to the Sent folder. You can easily add attachments to a private message. Here is the procedure, using an image as the attachment. After typing the text portion of the PM into the editor box, click on the Attach button at the bottom of the window. Next, locate the file on your local computer that you want to attach. Notice there is a 3-item limit. It’s a very good idea to put a description in the box to make your message accessible. Click on the Post button after attaching the files you wish. When attaching images and media files to private messages, they will appear embedded (inline) the message. Other attachment types will come in as a traditional attachment that users can download onto their own computers before opening. A “Delete” button is available at the top and bottom of the private messages list for your convenience. A “Delete” button is also available inside a message, after you open it. You can check one or more messages, and click on Delete to delete them permanently. NOTE: It is strongly recommended that you do not delete Private Messages from your class. Leave them stored as a record of your private class communication. You may need to refer to them in case of disputes. The “Delete” feature, however, can help you clean up trivial private messages. You can create folders and move specific private messages in them. To create a folder, click on Folders on the left menu and then click on Add. Enter a name for the folder and Save. To move one or more messages to a folder, check the box to select it and then click on Move to Folder and select the folder from the drop-down menu. To delete a folder, click on Folders, check a folder to select it, and click on Delete. Folders must be empty in order to be deleted. Note: Folders do not get copied to new sites with import from site. Etudes is lenient with regard to types of filenames that you can attach to messages, assignments, etc. File types which are NOT allowed include: .exe, .bat, .pif, .bin. You can attach up to 3 attachments maximum per PM. The default file size limit is 100MB per post. If you attach an image, make sure it is no larger than 600 pixels wide. Otherwise it will be too wide in the browser.